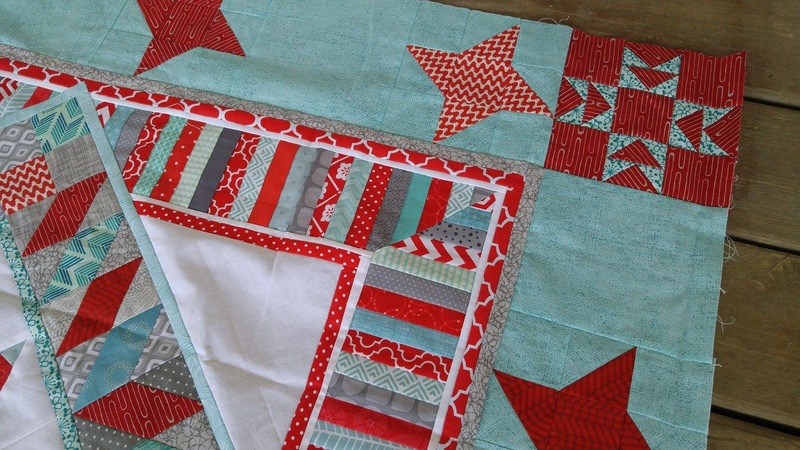 It's the beginning of May, so it's time to reveal the final round of the round robin quilts! If you missed the first three rounds, you can catch up here - Round 1 - Round 2 - Round 3. 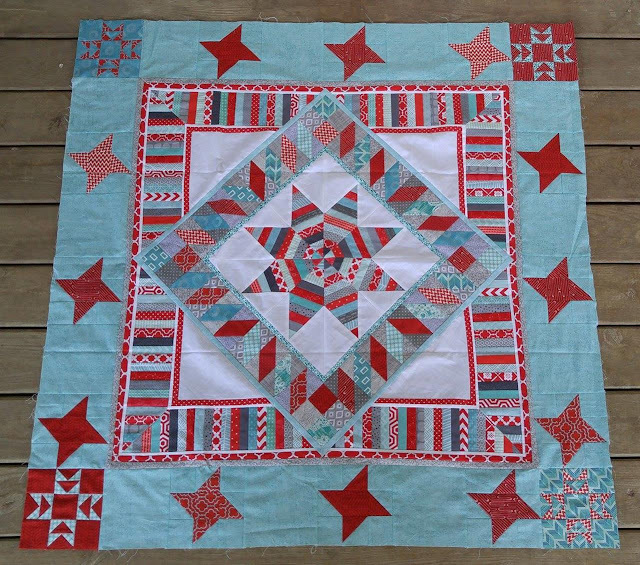 This was the last time Heather and I swapped the quilts! Now we will each finish our own (we're giving ourselves two months to do that!). Do you remember what Heather's block looked like last month? 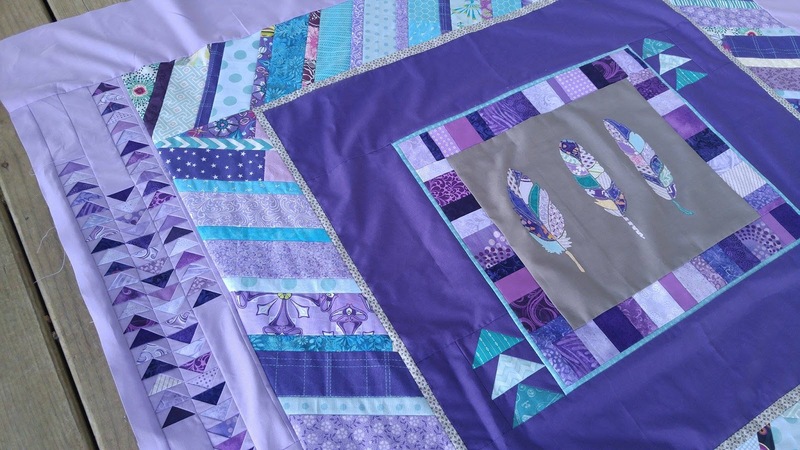 She had added a border of purple and aqua fabrics. On her block, we had inadvertently been following a pattern: solid fabric, patterned fabric, solid, pattern. So I knew I wanted to add a primarily solid border. I also wanted to repeat the triangles from a previous border. I debated between using an aqua or purple solid. I decided to go with purple. I decided that I would do "tiny geese." 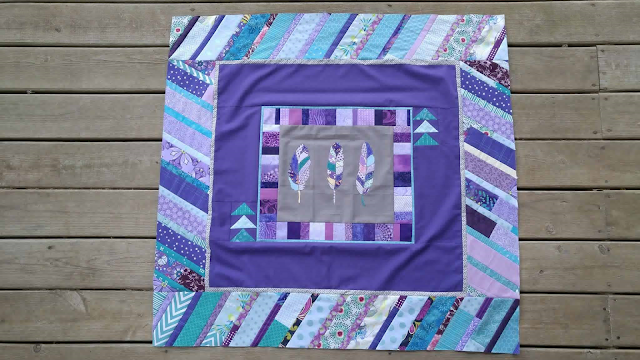 I made a template on the computer and started chain paper piecing. Each triangle (or goose?) measures 3/4" tall and 1 1/2" wide. Although the pattern seems simple, it took forever to get the lengths I wanted! 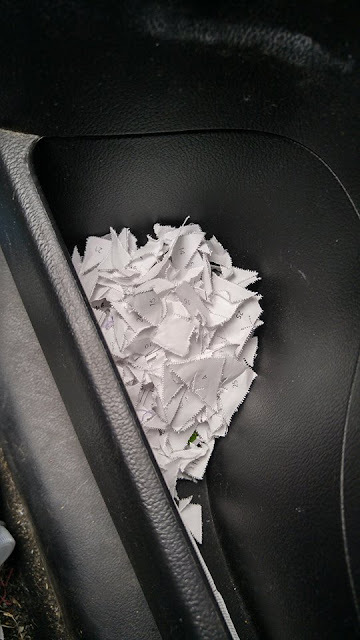 I saved the paper removal for a road trip. It was a great project to keep me busy in the car. I REALLY wanted to add something else. I just felt the idea wasn't finished yet. But I decided to attempt following the rules this round, so I left it alone. 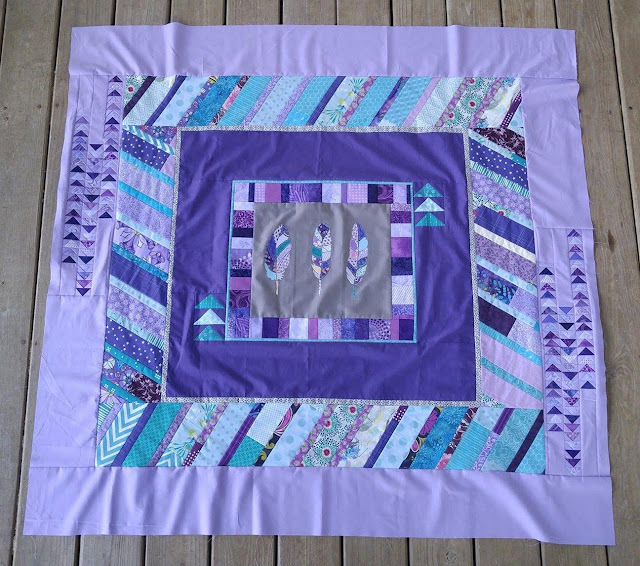 The border I added is about 6", so her quilt now measures around 52" square. The quilt top doesn't seem to lay very flat. 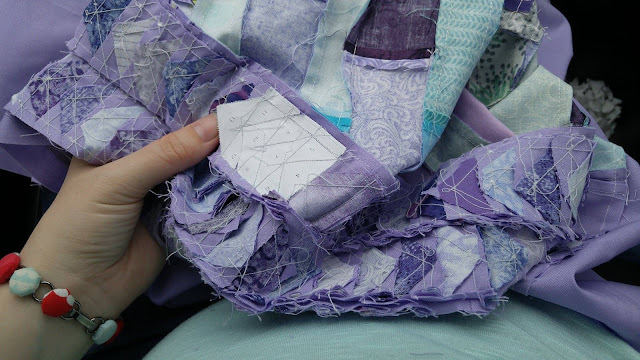 I'm not sure if it's due to some of the fabrics or some of the stitching. 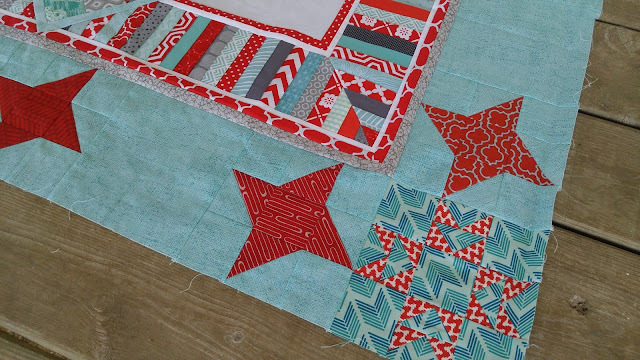 Either way, I hope it quilts out for the most part! 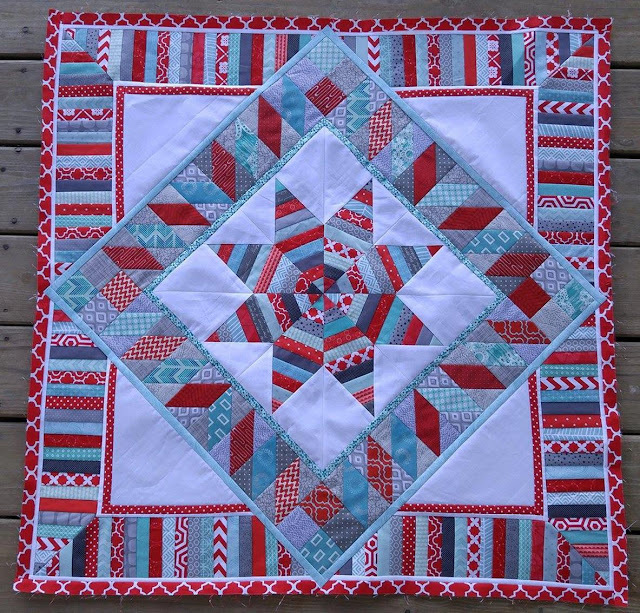 I really like it so far, and want it to quilt up well! 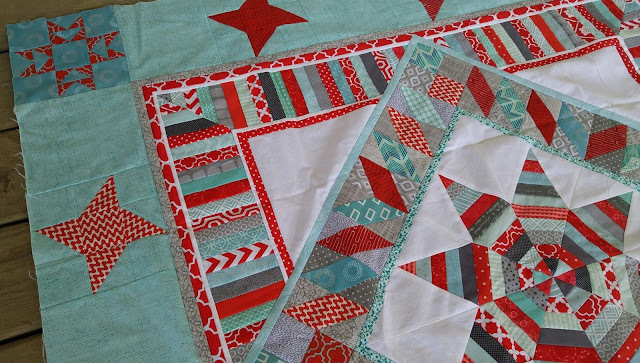 Now for what Heather added to my quilt! Remember what it looked like after the last round? Heather added three red friendship stars on each side with an aqua background. 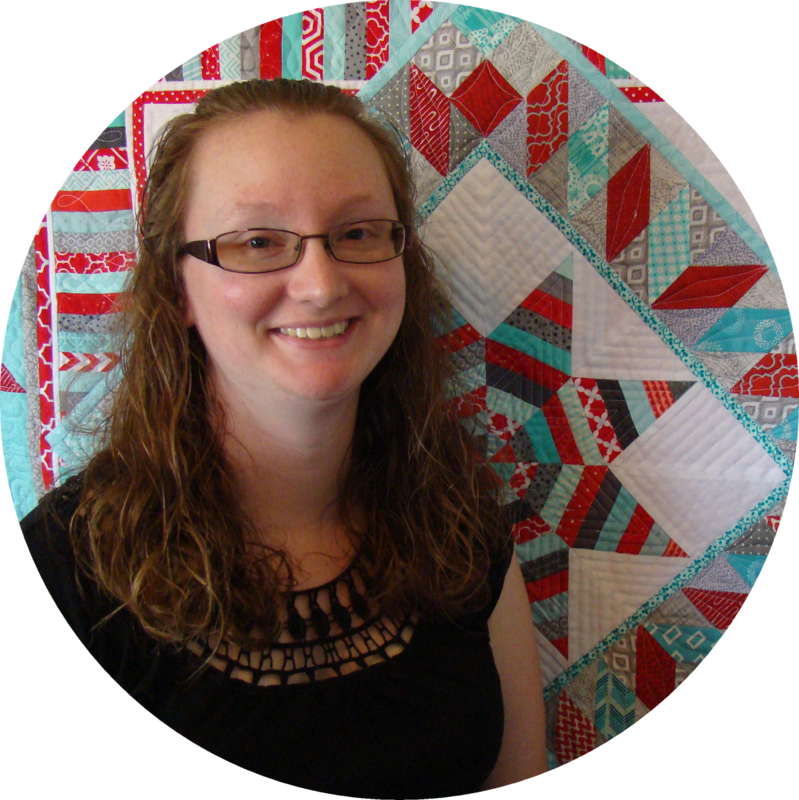 And since this round robin swap has been about trying new things, Heather tried paper piecing for the first time! 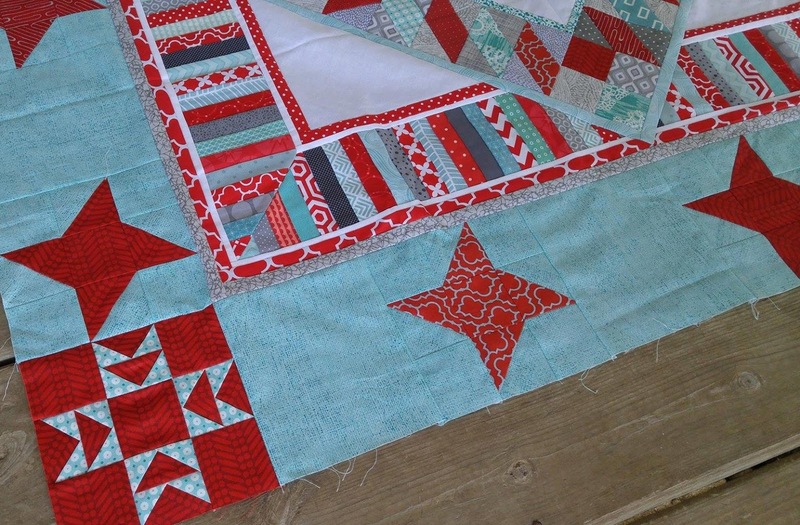 The corner blocks are paper pieced Double T blocks. We each have our own quilts back now. We've given ourselves two months to finish them however we want. We might add some more borders, or maybe not! 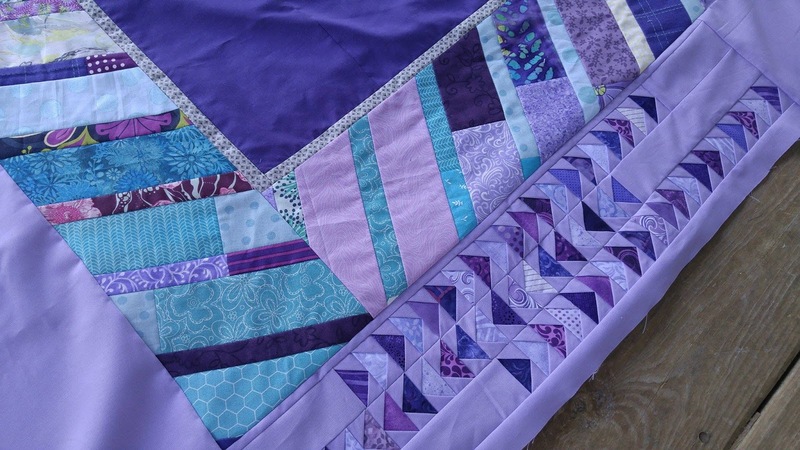 You'll have to check back in a couple months to see the finished quilts! What a fun idea. May have to try something like that someday. It has been SO much fun! And a great creativity stretcher! Beautiful! Very creative. 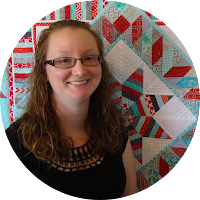 One suggestion though...about flatness...Heather's striped border has bias edges. 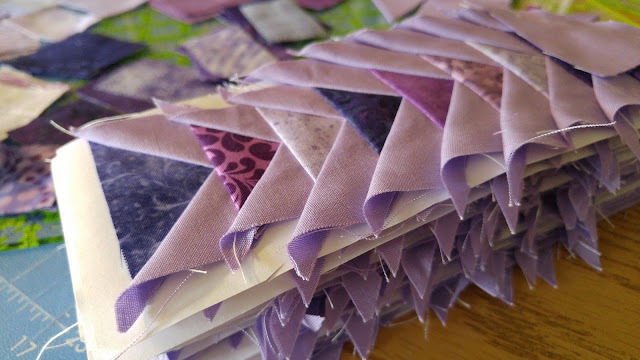 They will stretch as bias does so starch it firmly and press it under a flat surface with weight on it (a good heavy book) until it is cool. That should flatten it out. Thank you! Great idea about using starch! I'll let Heather know to try it!